When I was a small boy, every end of the year, during the school holidays, I always visited my grandparents in Labuan. The most interesting story I heard was that huge amount of Ming vase which was discovered at Pulau Enoe, that used to be a small island (now part of the Labuan Island due to reclamation works). This shows that there were Chinese traders or probably settlers here in the 1500's. Besides the Chinese, the early people of Labuan might be Kadayan farmers and Bruneien fishermen. 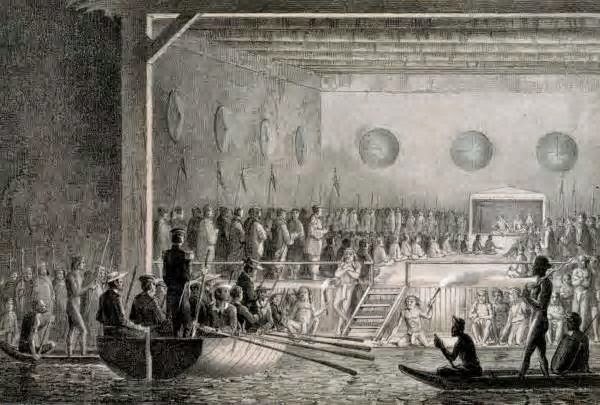 On 18th December 1846, James Brooke signed a treaty with the Sultan of Brunei, Ali Omar Saifuddin, thus establishing British influence over Labuan. The British hoisted their flag on this island on 24th December 1846. The Sultan ceded Labuan to the British probably due to the menacing pirates, which he couldn't handle. To him, only the British could bring peace and stability to this region. This was also why the British had a keen interest in Labuan: they need a naval base to suppress piracy. 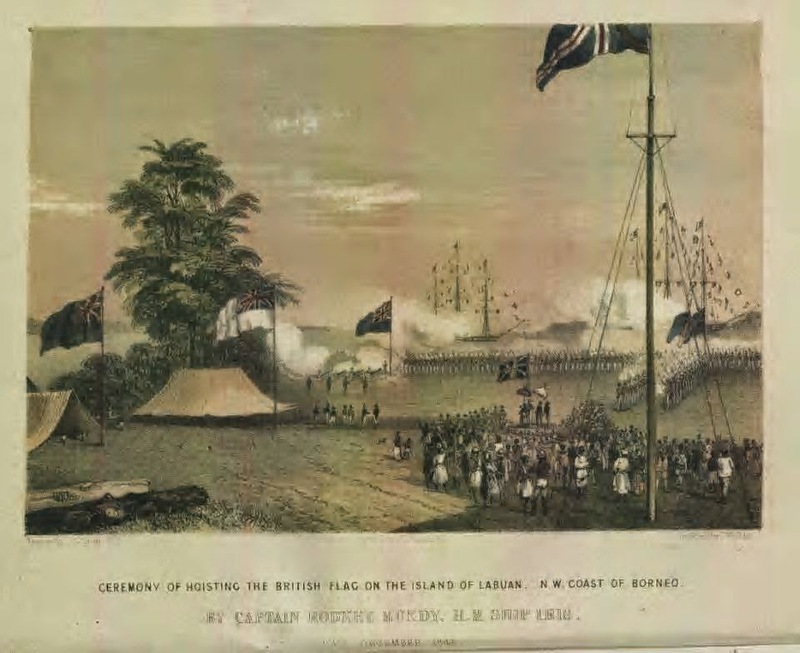 Below is the famous iconic pictures of early Labuan, the signing of the treaty with Brunei and the raising of the Union Jack on that island. In 1848, the island became a Crown Colony and in 1907, Labuan became a part of the Strait Settlement that include Singapore, Malacca and Penang. The British planned to make Labuan into a port rivaling Singapore but the location of the island was unsuitable and the plan was abandoned. In 1941, the Japanese invaded Labuan and renamed her Maeda. My great-grandfather, Haji OKK Awang Besar used to tell me stories about the Japanese occupation. He witnessed the Japanese was harsh master but far less dedicated to terror compared to the German Nazi. They are cruel, rather than brutal. They bullied more than they murdered. He told me he once cycled into a restricted area, one late evening in 1944. Immediately he was shouted at by a young Japanese sentry. The soldier scolded and lectured him in broken Malay. He asked him turn back. He said, " I fear for your safety: from the Kempetai!" The Kempetai were Japanese military police who commit most of the cruelty that gave the Imperial Army a bad name. The Japanese surrendered Labuan to the Allies in June 1945. The British came back to rule Labuan. In 1963, Labuan together with North Borneo and Sarawak was given independence by the British. Labuan became part of North Borneo (Sabah). 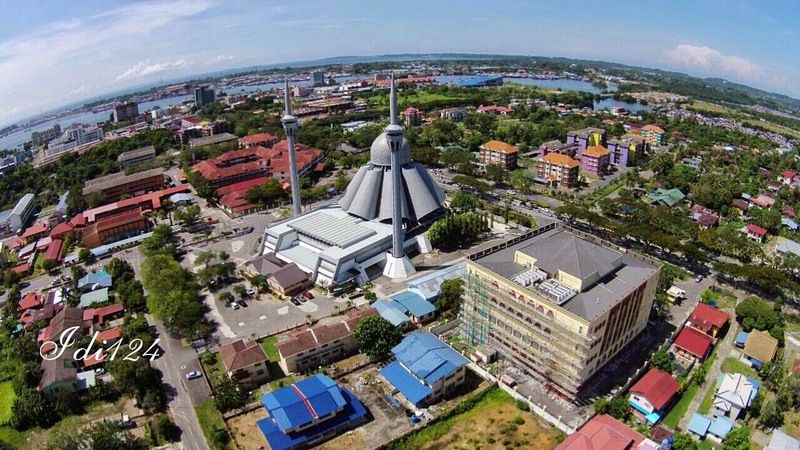 In 1984, Labuan was given away by the Sabah State Government to the capital of Malaysia, Kuala Lumpur. So upset was the people of Sabah that they brought down the ruling Berjaya Government in 1985, who made this fateful decision. The above picture is the view of Victoria (named after Queen Victoria), the old name of Labuan Town.